At the end of Fuzzy Navel, J. A. Konrath surprised readers with an agonizing cliffhanger: One of Lieutenant Jacqueline “Jack” Daniels’s loved ones is dead. But who? 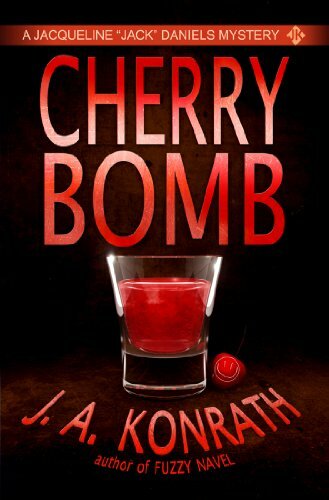 Readers were left clamoring to know more.Cherry Bomb, the sixth Jack Daniels mystery, opens at the funeral. While Jack stands graveside, tears in her eyes, her cell phone rings. It’s the killer, escaped maniac Alex Kork, taunting Jack, drawing her ever further into a twisted game of cat and mouse. Because while Alex is more than willing to kill random victims, Jack is her true prey. But which woman wants revenge more?Cherry Bomb is J. A. Konrath’s most gripping novel of suspense yet—filled with twists and turns that will keep readers on the edge of their seats.